Just because it is December doesn't mean you retire your sunglasses. In fact the sun seems to blaze in the worst way, some days if you ask me. I want to share with you one of my favorite products for my children's eyes. Real Kids Shades. 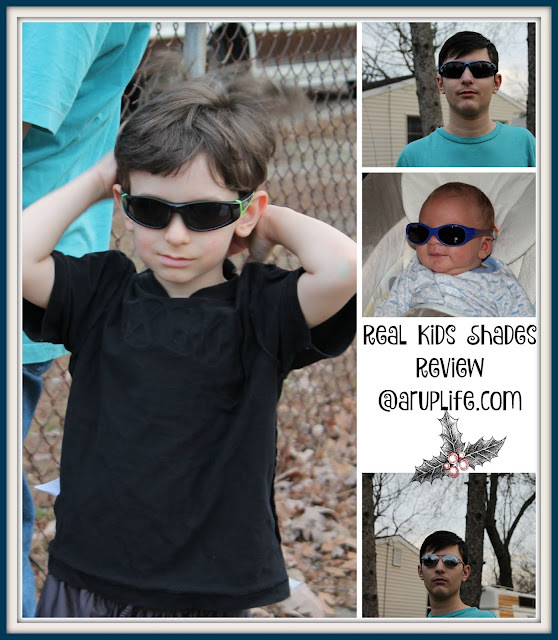 They have shades for kids from zero up to teens and they are just a fabulous quality product! Sunglasses should eliminate glares and squinting. Make sure the glasses block at east 99% of UV-A and UV-B ultraviolet rays. Frames should be bendable and unbreakable - supporting an active lifestyle. Polycarbonate is the most impact-resistant material and the best choice when purchasing shades. Visit Real Kids Shades for additional information including how to purchase! It has been a crazy few weeks in the Rup house. Between having a new and very colicky baby and cold/wet weather we haven't really been outside much. Then this weekend the weather was 70! In NJ in December that is quite a rare and wonderful treat. Unfortunately one of my bigger kids has a cold that has passed through our house but I was able to get three of the children to model for me with their shades on! One of the things I love about this product is they come in a protective case. It makes storing them so easy. I can stash a pair in the diaper bag or car for when we need them. We've had several pairs of these glasses floating around the house over the years and all are JUST like new even the ones we've had for some time. That is saying something for a kid's product that can last and last! The fit is fabulous. My kids have big heads and glasses will hurt the sides of their heads but not with Flex-FitTM. That little bit of give makes for a very comfortable fit. ARupLife.com received product, press or compensation to facilitate this review. This post may contain affiliate links. We only give our honest opinons of products. This post is in accordance with the FTC 10 CFR, Part 255 concerning the use, endorsements or testimonials in advertising. Like the Flex Fit explorer polarized Ages 0 plus. Thanks! I like the Explorer Polarized Ages 2+ sun glasses. I like the Explorer - Baby - 0+ - P2 Polarized Lens in pink. I like the Storm - Young Adult - P2 Polarized Lens best. I like the Breeze - Kid - 4+ - P2 Polarized Lens in Aqua/Pink.